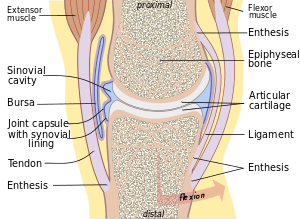 The enthesis (plural: entheses) is the connective tissue between tendon or ligament and bone. There are two types of entheses: Fibrous entheses and fibrocartilaginous entheses. "Enthesis" is rooted in the Ancient Greek word, "ἔνθεσις" or "énthesis," meaning “putting in," or "insertion." This refers to the role of the enthesis as the site of attachment of bones with tendons or ligaments. Relatedly, in muscle terminology, the insertion is the site of attachment at the end with predominant movement or action (opposite of the origin). Thus the words (enthesis and insertion [of muscle]) are proximal in the semantic field, but insertion in reference to muscle can refer to any relevant aspect of the site (i.e., the attachment per se, the bone, the tendon, or the entire area), whereas enthesis refers to the attachment per se and to ligamentous attachments as well as tendinous ones. A disease of the entheses is known as an enthesopathy or enthesitis. Enthetic degeneration is characteristic of spondyloarthropathy and other pathologies. The enthesis is the primary site of disease in ankylosing spondylitis. ↑ Benjamin, M.; Toumi, H.; Ralphs, J. R.; Bydder, G.; Best, T. M.; Milz, S. (April 2006). "Where tendons and ligaments meet bone: Attachment sites ('entheses') in relation to exercise and/or mechanical load". Journal of Anatomy. 208 (4): 471–90. doi:10.1111/j.1469-7580.2006.00540.x. PMC 2100202 . PMID 16637873. Resnick D, Niwayama G (1983). "Entheses and enthesopathy. Anatomical, pathological, and radiological correlation". Radiology. 146 (1): 1–9. doi:10.1148/radiology.146.1.6849029. PMID 6849029.